Pacific Gas & Electric (PG&E), the largest Investor Owned Utility (IOU), located in California. 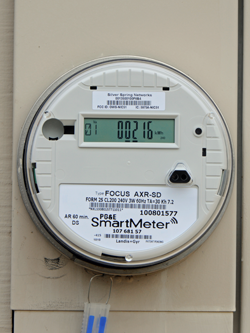 In a quest to modernize the current electric grid into a Smart Grid that is safe, more reliable and efficient, PG&E undertook their SmartMeter™ project to deploy wireless “smart” meters. This project impacted PG&E’s entire service territory, from Santa Maria/Bakersfield, California north to the Oregon border, covering 9.7 million gas and electric customers in 70,000 square miles. The two-way communication device connects homes to the electric grid, allowing consumers to see how and when they’re using energy in greater detail to help manage the demand on the grid and increase service and reliability. It’s part of the “smart” grid initiative, spearheaded by technology firms and backed by the Obama administration and Department of Energy. Contact us to learn more about how EnergyComm can source products for your utility maintenance and construction programs. 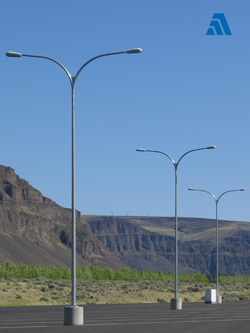 Ameron Pole Products is a premier manufacturer of steel and concrete lighting poles. They’re recognized as the nation’s number one manufacturer of spun-cast concrete streetlighting poles, prestressed with steel cables for maximum durability. For years Energy Comm has provided Ameron poles to utilities for projects ranging from typical public roadway to private housing golf course lighting. Poles are available in various heights, finishes and mounting configurations. Utilities had been accustomed to lead times of six to eight weeks for poles, although sometimes delivery times are up to 16 weeks. which is especially beneficial in emergency situations such as car pole accidents. Most steetlighting poles are routine because they’re tapered steel galvanized poles with mast arms and lighting fixtures. Ameron’s are unique and our customers appreciate their quality: they’re spun-cast prestressed which make them superior to other types of concrete lighting poles. They’re innovative, very durable and virtually maintenance-free. Eco Electrical Systems designs and manufactures wildlife outage protection products for overhead electrical distribution systems and substations. Their products are used worldwide by utility companies and energy providers as a proactive approach to protect power lines and equipment from wildlife interacting with them and causing failures or outages. Utilities are faced with the challenge of finding a solution to prevent wildlife from causing equipment failures or outages, as well as avoiding major fines from the U.S. Fish and Wildlife Service (USFWS) if they’re audited for compliance in reporting electrocution of protected raptors. Utility poles provide perches for birds to hunt for prey or shelter from the sun or other elements. Smaller birds perch above electrical equipment and when they defecate the droppings can buildup on equipment, bushings, cutouts, arrestors and terminators which can cause equipment failures or outages for residential and industrial customers. Most U.S. utilities have tried several different raptor protection devices on their distribution and transmission systems. 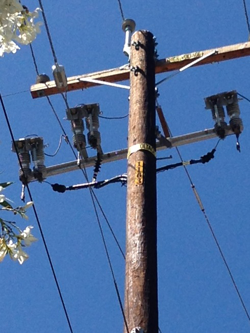 Several California utilities requested that Energy Comm provide raptor protection products. Energy Comm’s sourcing evaluated products and identified Eco’s products to be unique and reliable. Energy Comm went a step further and has provided training to several utilities, MRO distributors and contractors to ensure success with their raptor protection installation projects. Our customers appreciate that Eco products are made of a proprietary HDPE material with excellent UV protection and wind/tracking resistance. Their sky blue color is an industry standard. Their modular design and snap-fit pins ensure easy fastening to the line, installed either by rubber gloves or a hot stick, and prevent covers from blowing off or becoming dislodged during high winds. The Avian Power Line Interaction Committee (APLIC) has suggested practices for avian protection on power lines, which is a good reference for reducing bird-related and other wildlife-Induced outages. To learn about the Eco products Energy Comm provides, from cutout covers to conductor covers and transmission tower covers, contact us today.